There has been a few attempts at showing us a regular updated list of tweets on our iPads. Most has us pulling down on the list to refresh. A large group of recent tweets are downloaded and we scroll up through them. 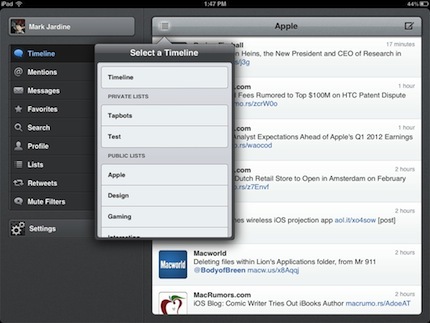 Tweetbot for the iPad has been updated to give us tweets as they happen. The developers of Tweetbot report that now when the iPad is connected to the Internet via WiFi with the streaming turned on, you will be getting tweets as they happen. If you follow many people on Twitter, this could mean a fast moving list. 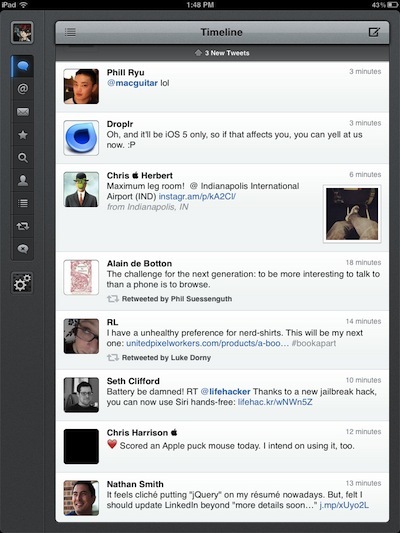 Since that would be rather hard to watch, Tweetbot has a feature that will really be handy now. Set up the Tweetbot ‘Timelines” for your friends, family, work, etc… then choose a timeline to watch rather than everything. The ability to have more control over the alert sounds is nice too since we don’t need to hear every time a tweet comes in when streaming!